NOTE: Photo's in this building report are small, made with the first generation digital JPG camera more than 15 years ago! 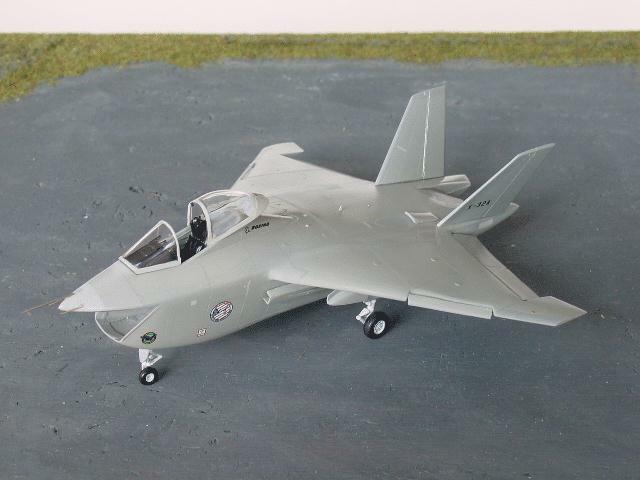 The Italeri kit of the X-32 is the first in this scale of the JSF. 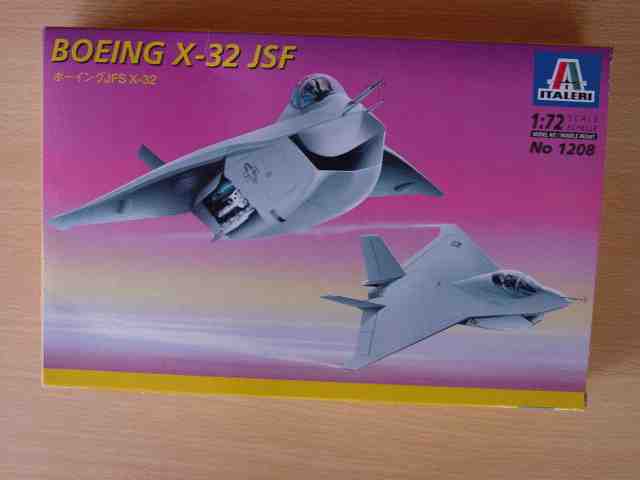 The kit is of the Boeing concept demonstrator, the actual JSF if selected of Boeing will be different, so you can only built this demo version. 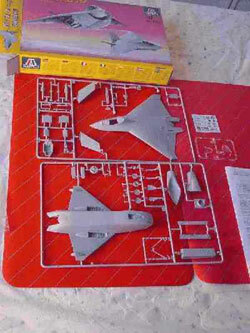 The kit is typically Italeri with good parts and the usual instructions. 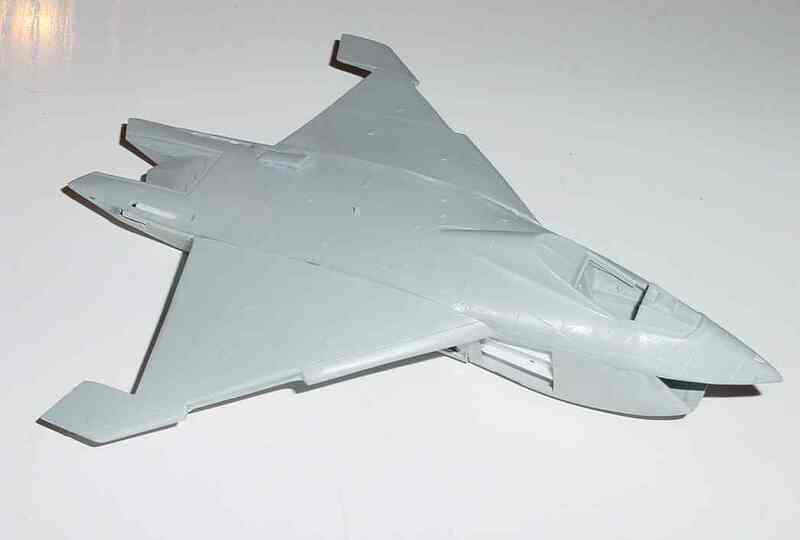 1- the size and shape of the vertical fins is entirely wrong. 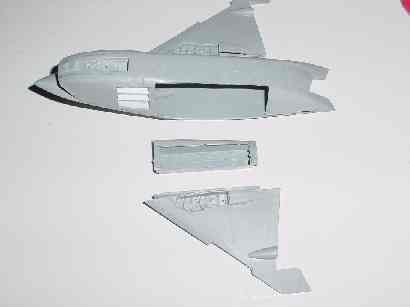 I would recommend that the average modeller substitutes the two vertical fins with 2 new ones from card. That will definitely give a major improvement to this kit. Shown lower kit part has the wrong chord and wrong sweep angle. 2-the intake is 4mm to width at the bottom; It is really not so difficult to correct and it will improve the look of this kit. Make two cuts as shown, bend together and glue together again. Looks difficult, is easy! 3- It seems that the wing is suspicious. 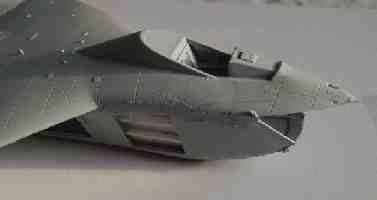 4- the tail area with the exhaust is not entirely right but is difficult to correct. 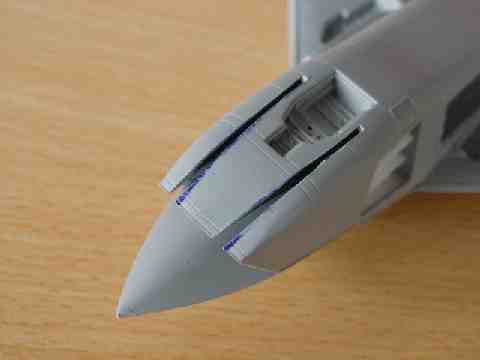 Also the vertical fin should be nearly flush with the aft fuselage section. Difficult to correct. 5- the intake fairing on top of the fuselage before the left fin should be 15 mm long and 8 mm before the fin leading edge. Making a new one is recommended! 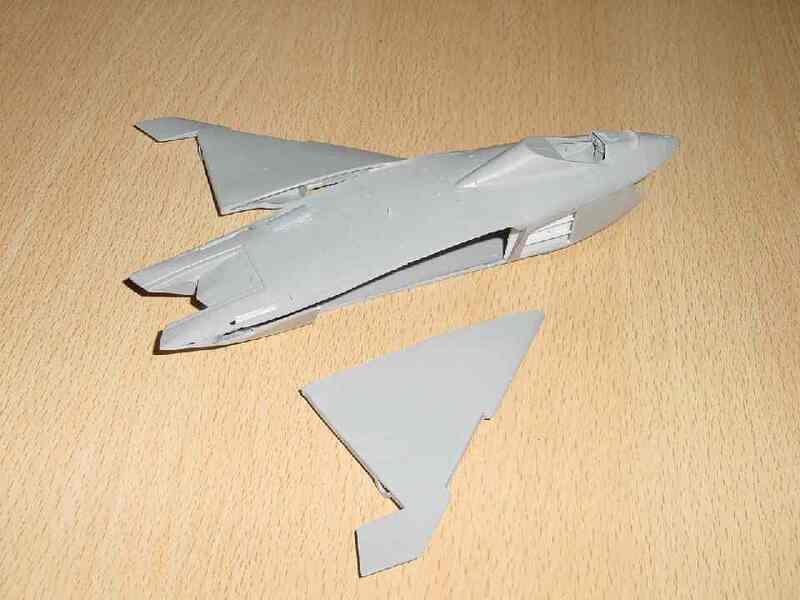 The model with new fins, cut-out slats and new upper fuselage intake fitted. 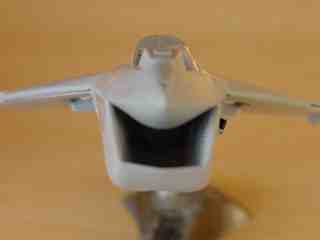 Wing position still under review as it should be probably set 6 mm more forward. - The cockpit fairing on top of the fuselage is a little to "steep", but best to leave it that way otherwise you will have to make a new canopy. - The cockpit will benefit from adding some more detail. - The weapons bay can (after being positioned 6 mm more foward) be further detailed. 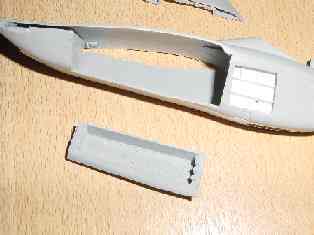 It is necessary to fill the seam between the fuselage and parts no #22B and 23B. Do this before going on with assembly of the weapon-bay's doors. When you want to have these doors closed, you will need to fill the seams. 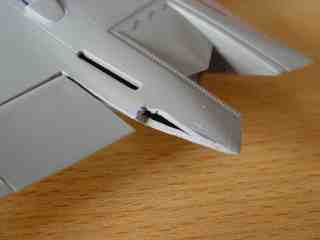 - The lower wing seams at the tips and the slats lower panelline needs to be filled with putty. 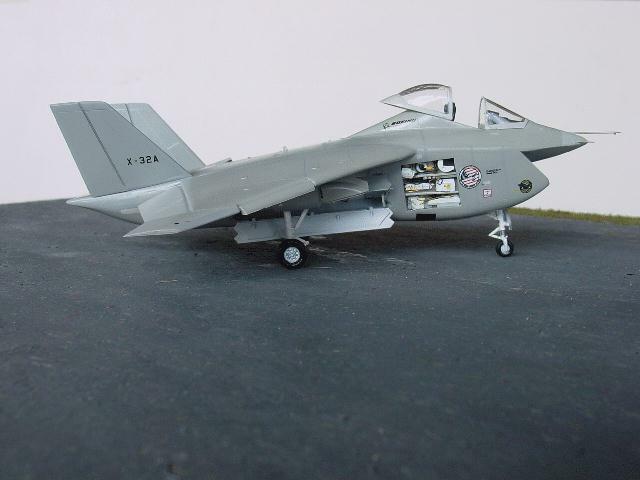 - a nice touch are a number of modern USAF weapons included with this kit. 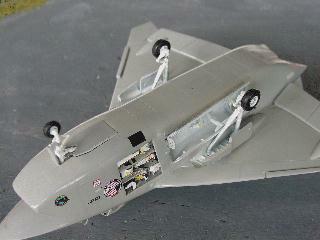 I personally cut-out the outher 2 slats and the avionics bay to give some more details. 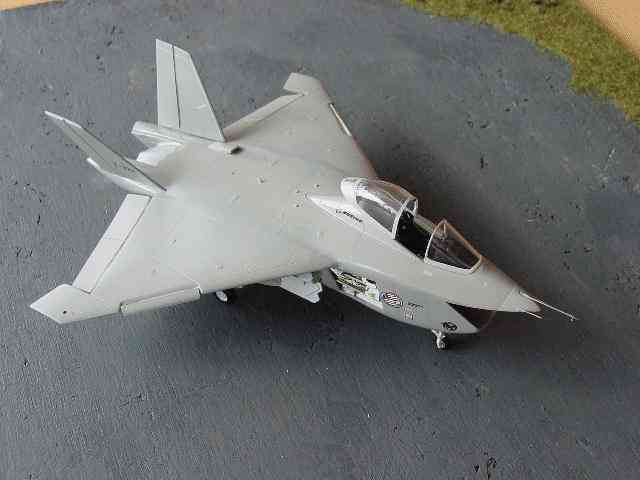 A small set of decals is provided for a X-32 prototype. The color instructions are unclear, some variations are already seen on this prototype! Well, I overlooked a big error in the wing position, so to get better results.. don't hesitate and cut-off the wings! The wing should be set 6 mm more forward relative to the fusealge. Also, the right main weapons bay should move with it! The wing should also be a little more rounded and curved, but this can be left as is as it is virtually impossible to correct. Some sanding can improve the look though. The weapons bay on the right side should also move 6 mm forward (with the right wing...) , so I decided to cut "around it" as seen. 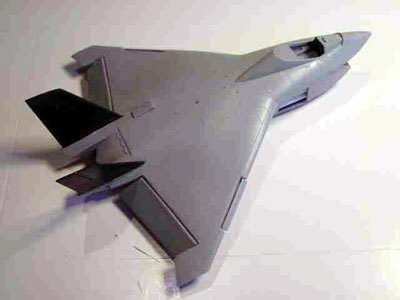 - positioned 6 mm more forward on the fuselage..
- wing trailing edge of the inboard flap reduced 2 mm in size to correct for the too large root chord. 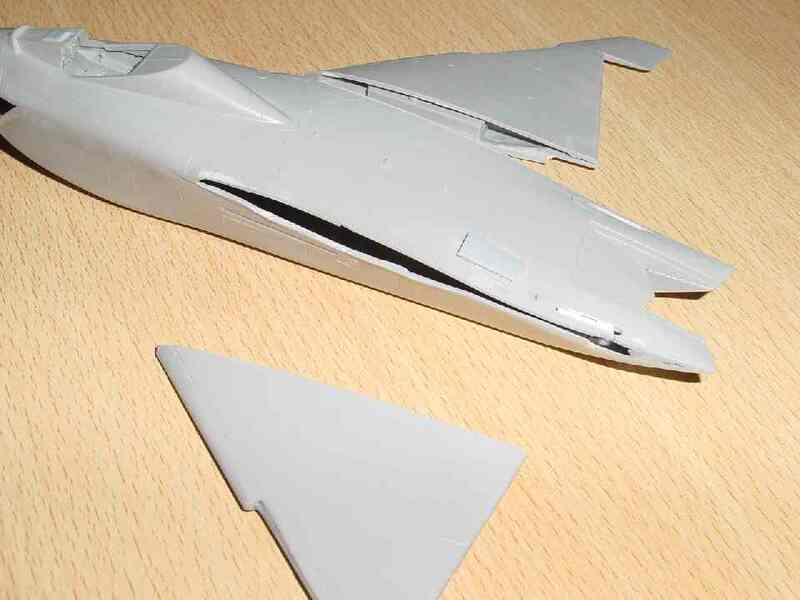 The cut-off wings are now set 6 mm more forward on to the fuselage. 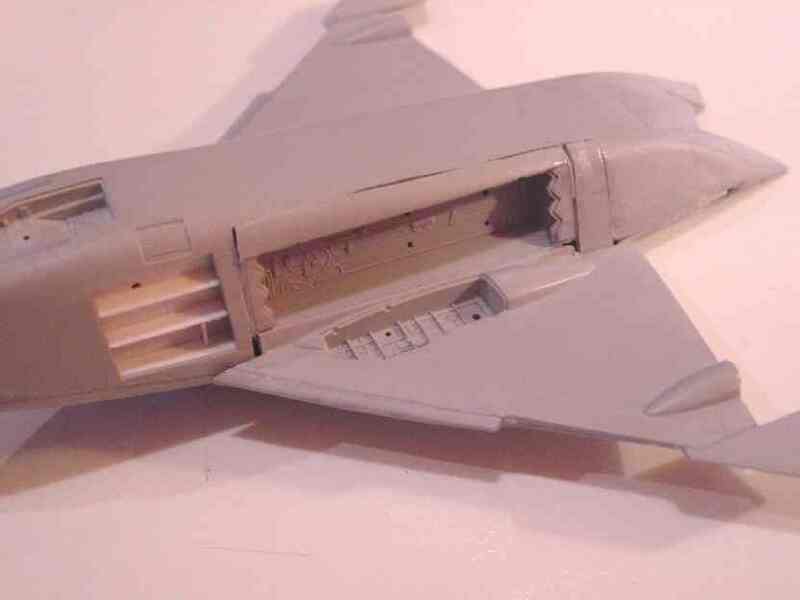 The right side fuselage weapons bay has also been moved forward. The part removed forward of the bay has been re-used to close the new gap at the rear. No putty is set yet, but is needed to close all gaps and to get a smooth result. 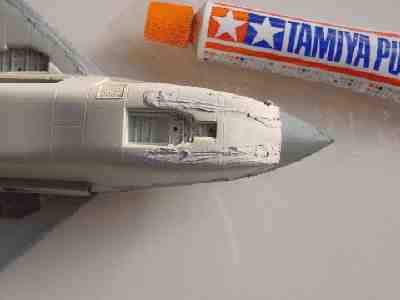 The model having its "light grey" color, for which I used Humbrol 166 light satin grey (a mat sort of FS36440). I also picked out some leading edge panels in another light grey color. The avionics bay is also seen. 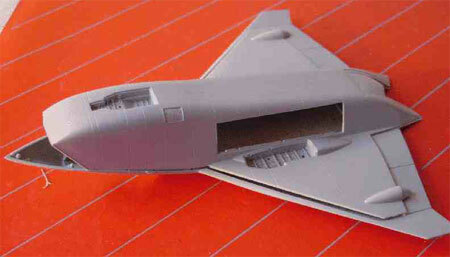 Note cut out slats and dropped flaps on the model made. And there it is... ready for virtual take-off..
- More info about the real thing at www.boeing.com! 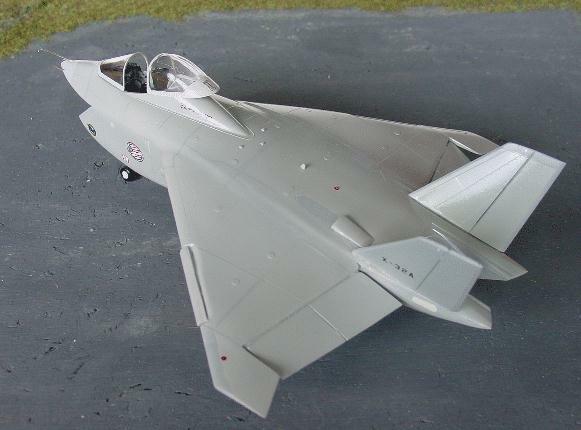 in November 2001, the DoD selected the Lockheed-Martin design as the JSF winner for Full Scale Development and System demonstration.